are. 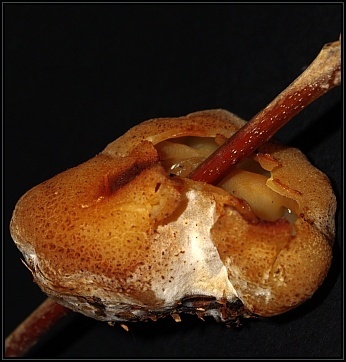 Several fruiting bodies growing gregariously. Size range of examined material 46-70mm in 'diameter'. 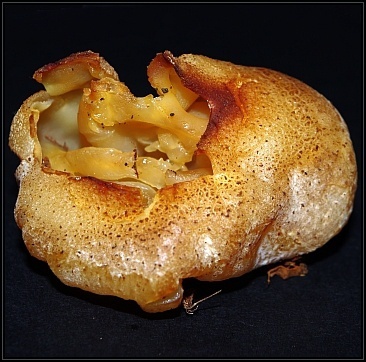 Shape bladder-like to irregularly shaped (sometimes fused together), partially closed with partially split margin. 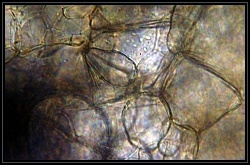 Inner surface (hymenium) is smooth, pale yellow-brown in colour. Outer surface is slightly darker in colour, furfuraceous with darker patches. Asci: 8-spored, uniseriate, with rounded tips, positive to Melzer's reagent. 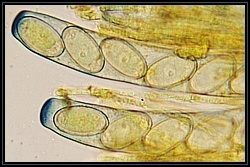 Paraphyses: Thin, hyaline, septate with slight constrictions at the septa. 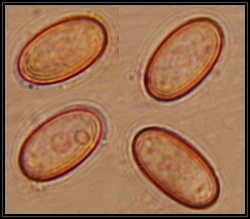 Spores: Ellipsoid, hyaline, smooth, aguttulate (no oil drops). 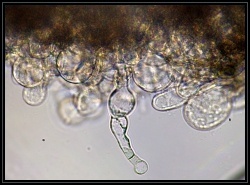 Excipulum: Made up of rounded cells with occasional hyaline erect hyphae on the exterior part.